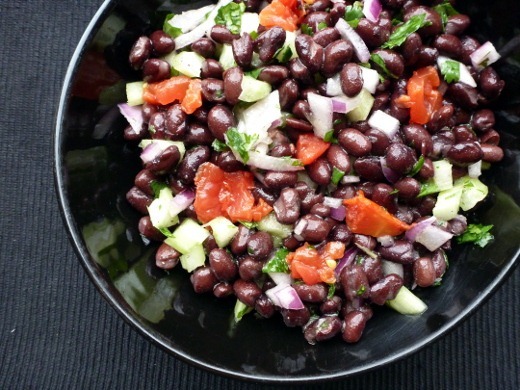 I’ve a lovely pair of dinner recipes for you today, courtesy of my favorite healthy recipe source: Cooking Light! A side and an entrée, which pair together perfectly. Let’s start with the side. Alternatively this makes also makes a great meatless lunch (I can tell you from experience, as that is exactly what I made of the leftovers!). 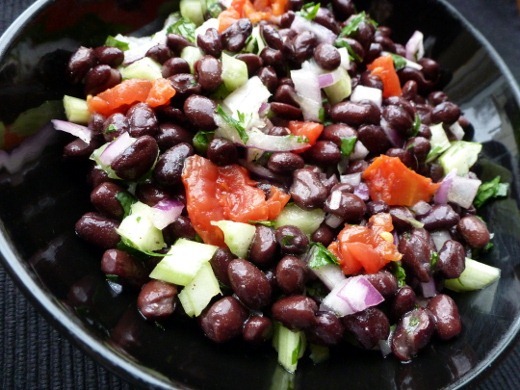 Black beans. Tomato. Red Onion. Celery. Cilantro. Lime Juice. Olive Oil. Salt. This is the kind of food I could live on. 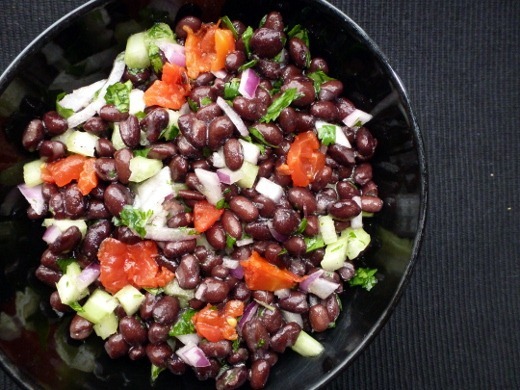 Combine 1 (15-ounce) can rinsed and drained black beans, 1 cup quartered tomatoes (fresh, cherry, or canned), 1/2 cup chopped red onion, 1/4 cup chopped celery, 2 tablespoons fresh lime juice, 2 tablespoons chopped fresh cilantro, and 1 tablespoon olive oil in a medium bowl; toss well to coat. Optional: add salt to taste. 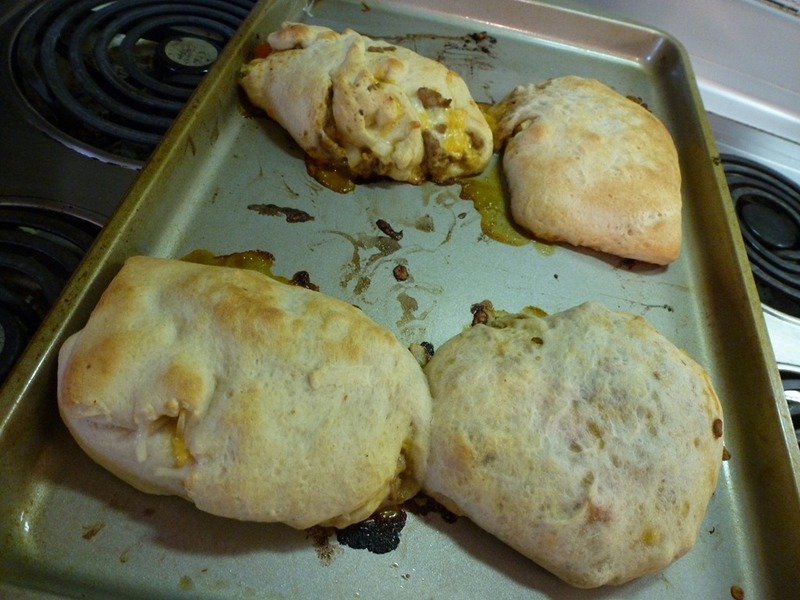 And for the main course, I made calzones! I do believe this is the first time I’ve made calzones. 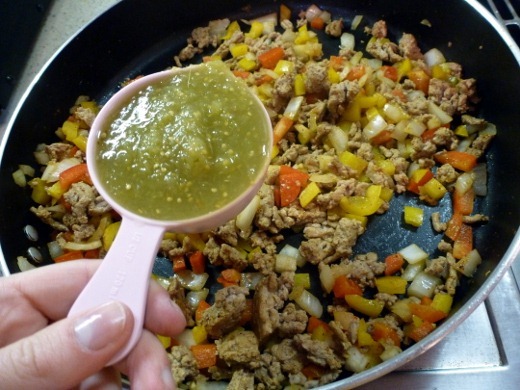 The filling was easy enough: ground turkey, onion and bell peppers, seasonings, and 1/2 cup of salsa verde. 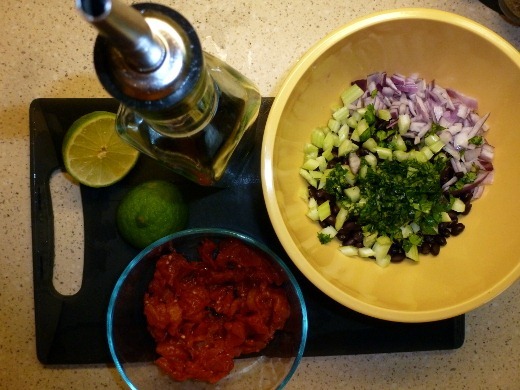 I am a huge salsa verde fan! I think that started back in college when I worked at the dining hall burrito bar. We went through so many giant cans of that stuff. So the dough comes from a can of refrigerated pizza crust. Cooking Light suggests a thin-crust pizza dough, probably to maximize surface area and minimize calories, but I wasn’t able to find thin-crust, so I just used regular, cut into four pieces. Looks like a lot of filling, right!? Well, it was a lot of filling. But no one said they have to be pretty. Just do your best. After baking, they look better! Even that sad one in the upper left corner below. Poor guy. But hey, it still tasted great. Or, Golden Brown, for those of you that don’t speak gangster. Slap ‘em together and you’ve got what I like to call DINNER. 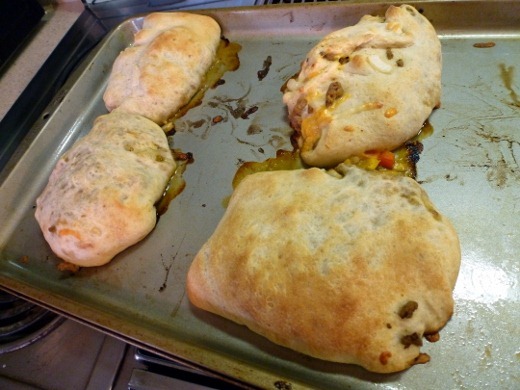 These calzones were off the chain, yo. I was a huge fan. Heat a large nonstick skillet over medium-high heat. 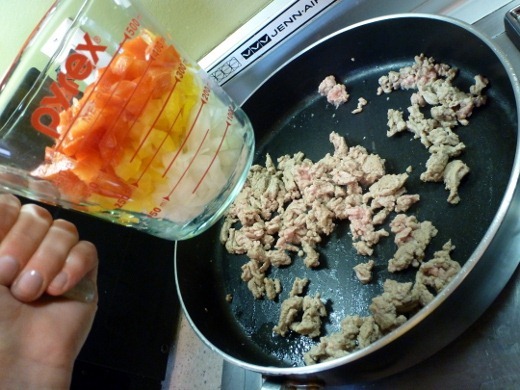 Add ground turkey to pan; cook 3 minutes, stirring to crumble. Add onion and next 5 ingredients (through garlic) to pan; cook 4 minutes or until vegetables are crisp-tender, stirring mixture occasionally. 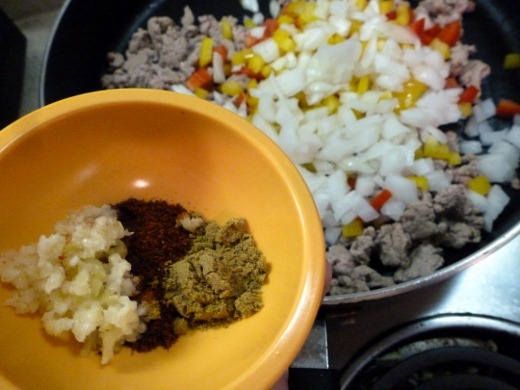 Remove turkey mixture from heat; stir in salsa. 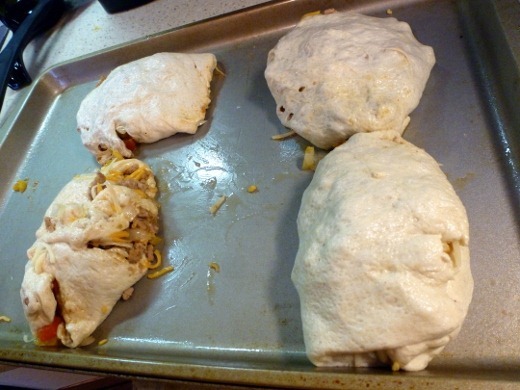 Unroll dough; divide into 4 equal portions. 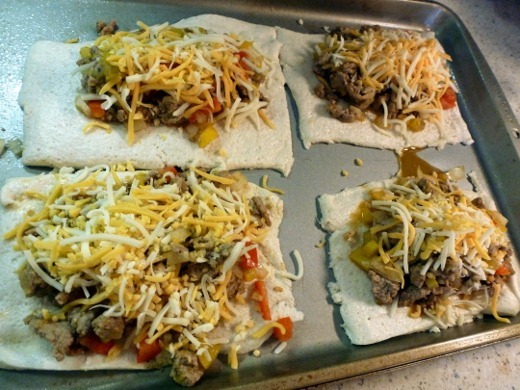 Roll each portion into a 6 x 4–inch rectangle. Working with one rectangle at a time, spoon about 1/2 cup turkey mixture on one side of dough. 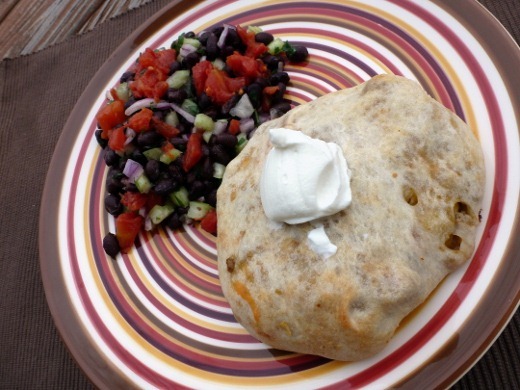 Top with 3 tablespoons cheese; fold dough over turkey mixture, and press edges together with a fork to seal. Place on a baking sheet coated with cooking spray. Repeat procedure with remaining dough and turkey mixture. Bake at 425° for 12 minutes or until browned. Serve with sour cream. Off to go watch a couple episodes of Girls! Any other fans out there? I’ve jumped on the bandwagon this week, during Xfinity’s Watchathon Week (only one day left – so sad!). 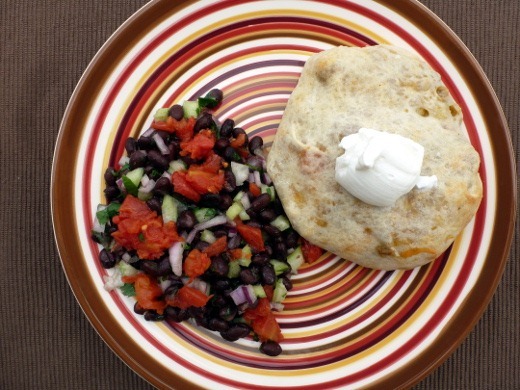 Pingback: Top Dinner Entrée Recipes of 2013–Part I | Meg.Goes.Nom.Nom.